There is no French Circle Time this Saturday. In fact, our French Circle Time program is concluded for the summer. Madame Marie will return in September with another season of French songs and rhymes for little ones and their grown-ups. Kids, come make a card for your dad or the other special big guy in your life this Wednesday, June 15, from 6:30 p.m.-8 p.m. You'll also be able to make farewell cards for your teachers -- just in time for the last day of school! We'll supply the materials, courtesy of our Friends of the Library; kids supply the creativity. Registration is required so we can be sure to have enough materials. To register, go to Program Registration - Takoma Park Maryland Library or call us at 301-891-7259. Spanish Circle Time, which is held each Thursday at 10:30 a.m., will be canceled on Thursday June 16 because Senora Geiza can't be here. Our program will resume on Thursday June 23 at 10:30 a.m. No registration is necessary for this hugely-popular program that is perfect for babies, toddlers, preschoolers and their grown-ups. On Monday, June 13, at 7 p.m., we'll kick off this year's Summer Quest reading program. All are welcome, and no registration is required. This year's theme is Summer Quest Goes Down the Drain. 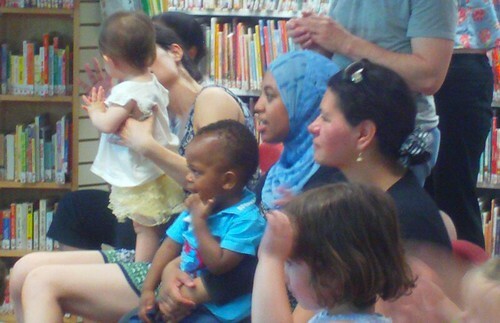 Each year, we're the only library in Maryland to create our own summer reading program, which is funded by the Friends of the Takoma Park Maryland Library. Dave Burbank, library assistant and artist extraordinare, writes the story and creates the art for Summer Quest, a read to play summer reading game. To start, kids pick a character from the many we have available; they color it in, give it a name, and then hand it to us. In return, we'll give them a copy of the Summer Quest story and a gameboard to take home. Each time kids complete one of the 10 reading challenges, we'll move their character along the giant gameboard in our Children's Room. The only rule is that the books must be checked out of our library to count towards a challenge. What's great about our Summer Quest program is that each child decides how he or she will win. Some kids like to read lots of books for each challenge. Others like to read thick books, while still others like to finish as quickly as possible. It doesn't matter, as long as they are reading! Books that are read to children, as well as audiobooks, work fine in the program. If you can't make it to the June 13th gala kick-off, don't worry. Kids can sign up for the program throughout the summer. We'll conclude our Summer Quest in early September, when we'll have a party -- complete with cupcakes and lemonade -- and everyone will go home with free new books. So come on in, and give our Summer Quest program a try! Even very young children can complete the challenges with their parents, and grown-ups might want to use the challenges to structure their own reading in the adult section this summer! Two-time Grammy Award winners Cathy Fink & Marcy Marxer performed at our Circle Times this week. Cathy & Marcy were giving a preview of their new book and CD, Sing To Your Baby. A fabulous time was had by all!